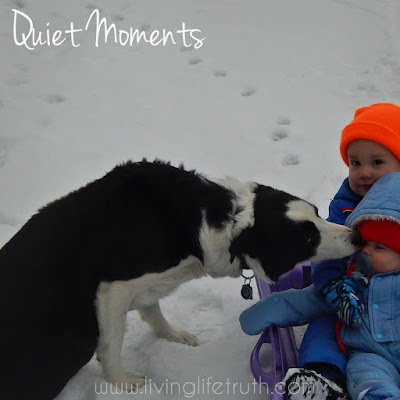 Our Five-Minute Friday Word: "Quiet". Quiet is beautiful and yet so hard to come by. The kids are in bed and I sit here in the quiet, feeling a bit unsure of what to do with myself. Sleep would be my best bet as the 10 o'clock hour nears. The Lord uses quiet to recharge the soul. In this wild and busy world, He is our one true Source of refreshment. He sneaks those precious quiet moments into my day when I least expect it. Snow crunching under my running shoes. Pulling the kids on the sled on a sunny winter day. Making memories unplugged from technology. Curling up on the couch on a January night. This is beautiful writing, Amy...lively and refreshing, and peaceful all atthe same time. And is that a Border Collie? There is one sleeping at my feet as I write this. 33 at FMF this week. Sure is, Andrew! He is such a sweet dog :) I'm sure yours is a sweetie as well! Great breed to own. I love your addition of Psalm 23 with the word quiet. When we find those least-expected moments of quiet, we find that he refreshes our soul, that we lack nothing, that he guides use along the right paths. Beautiful! It's so hard to find the quiet when we are busy with life. God truly does talk to us in the quiet. Love your Border Collie! Amazing dogs We had one but now have a goofy lab. 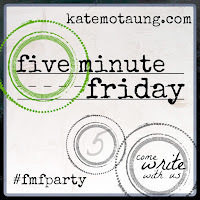 Stopping by from FMF linkup (I'm way down at #117 this wk).Wonderful post, Amy. He truly is our one source of true refreshment.